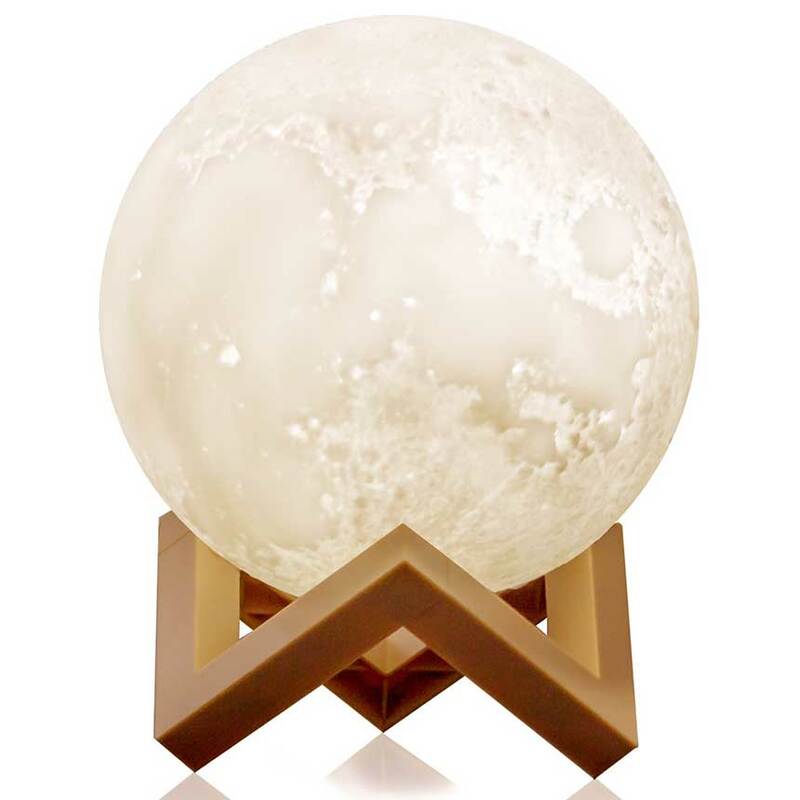 This 3d glowing moon lap is made using an advanced 3D printing method that gives the lamp a sharper look than comparable products on the market. The lamp adds a nice calming effect to any room! 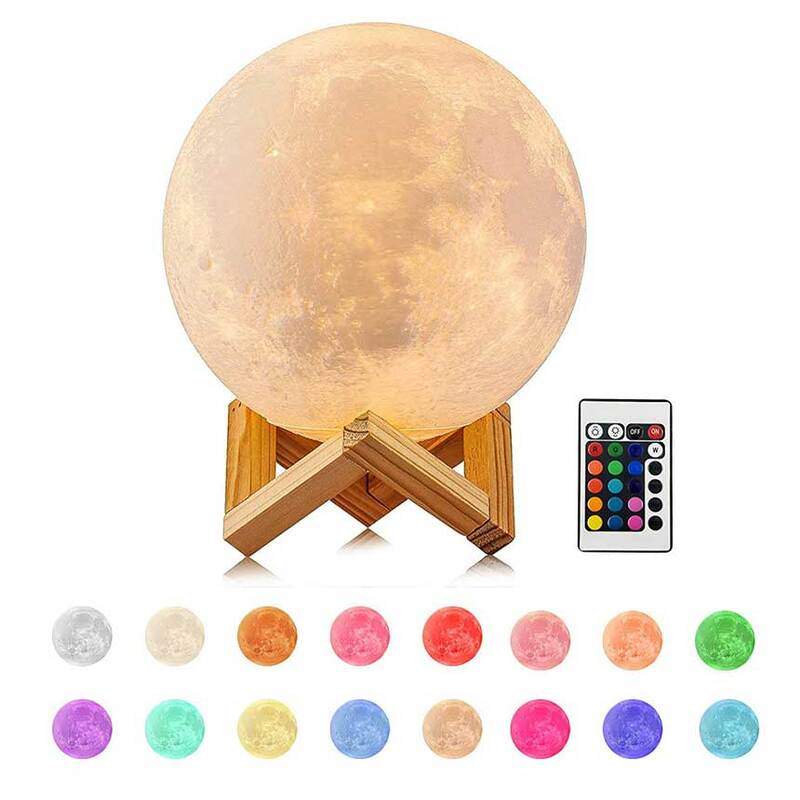 This glowing moon lamp comes with a stand that makes it great for the bedside. The ball doesn’t look all that impressive when it’s off, but when it lights up it looks awesome and looks just like the moon. The lamp glows in multiple colors including white and yellow. The lamp battery lasts about 4-20 hours depending on the brightness. Most users say it stays lit and glows for about 6-8 hours on a medium setting. The Charging time from 0 to full is about 3 hours. If you tap the lamp once it will glow white, if you tap twice it will glow yellow, and a third time will shut the lamp off. The lamp comes with a USB charging cable, wooden stand, and instruction manual. The lamp is available in a small (3.9inches), Medium (5.9 inches), and large (7.1 inches). The company that sells the lamp takes pride in customer service, if you have any questions feel free to send them a message, or if you have comments feel free to leave them in the description. Another good lamp that is a little more expensive is the one below. It lights up in many more colors, including red, orange, pink, blue, and many more. The color can be switched by touch or remote control. The soft light looks great and is easy on the eyes.